Pros A great study aid, perfect for those who can't/won't/don't want to do the real thing. Cons Isn't made for higher level classes, limited scope • Available only for the iPad. A while back I had the good fortune to review Emantras Inc.’s Frog Dissection app for the iPad. As a Biology major who’s not fond of doing dissections, it was wonderful. 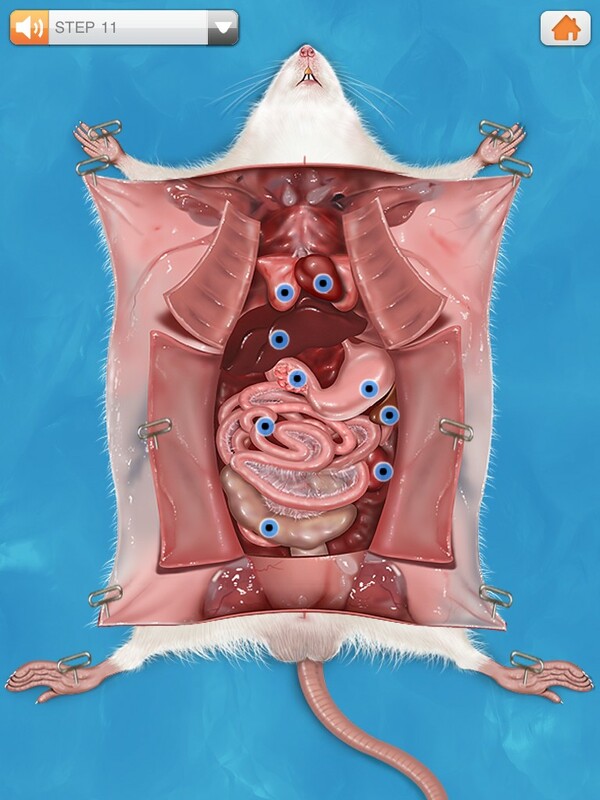 When I found out Punflay was developing a new one for rat dissections, I was very eager to try it out. Rat Dissection keeps things easy to use and very uncluttered. In fact, it was so simple, I just launched it and handed my iPad to one of my teachers who’s not very tech savvy, and he went to town. That’s the sign of a well designed program. The main screen has two primary choices: Start the Dissection, and View 3D Organs. In the dissection, you’re presented a (rather well endowed 😉 ) male rat and the tools you’ll need to see what makes him tick. The app has voice explanations of each step to take, so it’s very easy to follow along. You begin by pinning the rat to the tray, then cutting through several layers of tissue (pulling them apart and pinning them down as you go). Once you reach the organs, you can choose any of the dotted organs to see a 3D model of the organ, which you can rotate. Each image is accompanied by a long description of what the organ’s purpose is that is not only viewable as text, but will also be spoken by the same person that gave you your earlier instructions (great for when you want to inspect the organs and listen). The images are highly detailed and very accurate (confirmed by myself, and a Zoology professor at my College with a PhD specialty in rodents). Selecting “View 3D Organs” from the main menu, skips the beginning steps of the dissection and takes you straight to the already cut open specimen, allowing you to select and inspect each organ as you wish. This app really is a god-send for Biology students of almost every kind, and makes a great study guide, or even a replacement for those who can’t stomach an actual dissection. Just be warned, this isn’t made for higher level classes. There is no way to dissect down to the muscle groups, skeletal features, the brain, or other details. You’ll only find the basics here. That said, for studying the basics, Rat Dissection simply can’t be beat! or visit her personal website.